A 100-pound snake that left its owner's home in the Meadow Lakes area is still on the loose according to Mat-Su Borough officials. David Hyde, the albino Burmese python's owner, said early Wednesday that he had been looking the previous day for the snake. "I've searched about half a square mile, maybe a mile," Hyde said. A borough statement Wednesday reported "only bunny and cat sightings" in the neighborhood near Hyde's West Mallard Lane home. Residents of South Rainbow Street and West Swan Drive had also been asked to be on the lookout for the snake. Kirsten Vesel, the Mat-Su Borough's director of animal control, said that although the python itself wasn't found Tuesday, searchers did discover some skin the snake had shed after leaving its home. "They did find a little molt in a neighbor's RV that was somewhat disassembled," Vesel said. Hyde said Wednesday that he had taken in the nearly 20-year-old python, named Sam, from a shelter in 2008 after residents of an Anchorage home couldn't care for the snake. Sam typically has the run of Hyde's multilevel 4,000-square-foot home, Hyde said, along with a 17-year-old male cat named Partner. The two have "touched noses and smelled each other and backed off of each other," Hyde said, although living with snakes has affected Partner's behavior. "If you throw a pile of extension cord on the floor, he'll approach it slowly to make sure it's not another snake," Hyde said. On April 24, Sam was recovering from winter hibernation and ate five rats followed by a 25-pound rabbit. At that point, Hyde put the snake in a third-story bedroom to relax, but the snake got out. "Apparently he didn't feel like resting," Hyde said. "He felt more like going out and traveling." Burmese pythons are nonvenomous, making them legal to own as pets in Alaska, according to the state Department of Fish and Game. Borough officials had a brief scare Tuesday afternoon caused by a report of a 4-year-old child missing in the area, which prompted a response from Alaska State Troopers. "The kid was at a neighbor's house, apparently," Vesel said. "Everyone was panicking a little bit for a minute there." Temperatures overnight Wednesday in Meadow Lakes ranged from 37 to 40 degrees, according to the National Weather Service. That drop probably wouldn't be enough to kill the python, Vesel said, but the chill likely slowed the cold-blooded animal. "It probably didn't wander far," Vesel said. "It's probably nearby, curled up somewhere to stay warm." 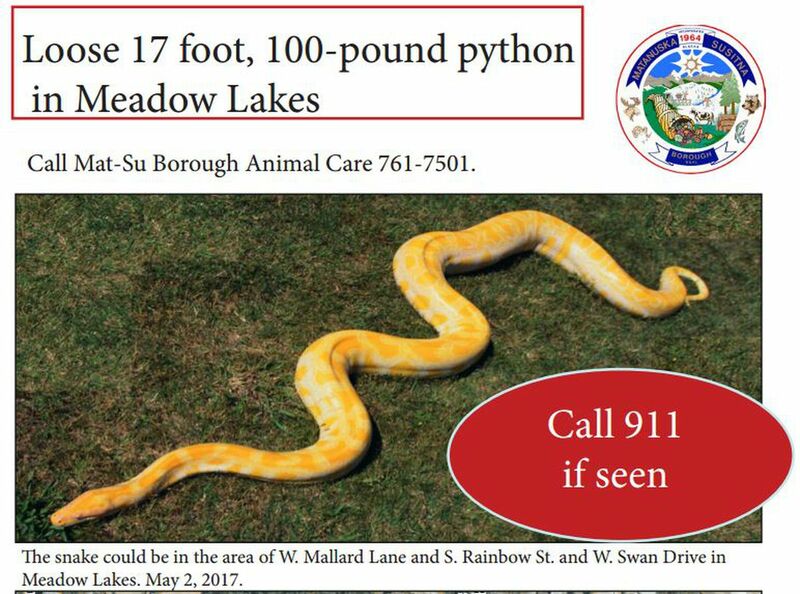 Joshua Ream, treasurer of the Alaska Herpetological Society, said in an email Wednesday that the overnight temperatures in Meadow Lakes were "pretty low for a snake," but that the fatal temperature for a Burmese python would depend on a number of variables. "Typically snake escapes will try to find alternative heat sources such as under freezers or near generators," Ream wrote. The April escape, Hyde said, was the first time Sam has left the house without him. Finding the snake, he said, often involves listening for its readily audible hiss rather than looking for its low shape in underbrush — especially in a neighborhood with construction projects and brush piles where it can readily hide. Hyde immediately alerted neighbors and posted fliers announcing Sam was at large. He said the incident didn't immediately get wider attention because it wasn't mentioned online. Hyde urged anyone who finds Sam to keep an eye on the python, and call 911 or Hyde at 907-376-6578 to report its location. "Walk straight up at him, so he can see you coming," Hyde said. "If he doesn't articulate his neck, or the first 4, 5 feet of him, he's not scared of you. He's not going to strike you." Alternatively, herpetology enthusiasts can lift Sam by a point roughly 2 feet behind the python's head, Hyde said, and carry the reptile over their shoulder "like a piece of rope." Sam also enjoys being massaged at a point roughly 5 feet behind the head. "He's like an old dog getting his itch scratched," Hyde said. "He'll push his coil into your hands and let you rub him."